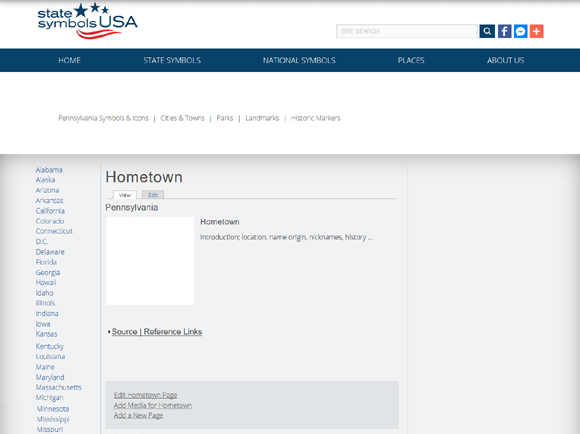 You must register to submit content to State Symbols USA - it's FREE! 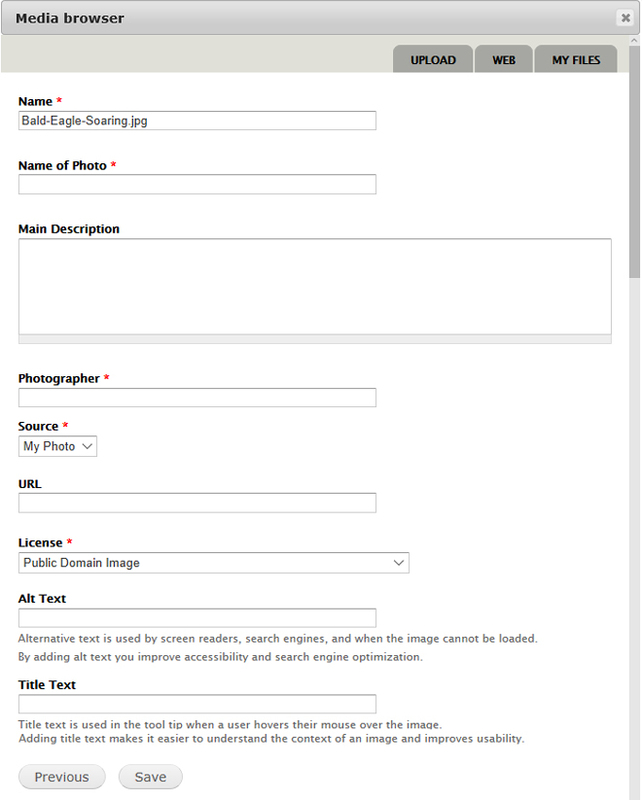 Once approved, you can login and edit a page, add a new page, add a photo, or add a video. Create pages for your community and take photographs to illustrate your pages; hometowns, landmarks, parks, historic buildings, and historic markers. What a great class project! All submitted content is reviewed and approved by our staff before publication, so DON'T BE SHY! CONTACT US with questions. Or click the "Edit Page" link below the article. 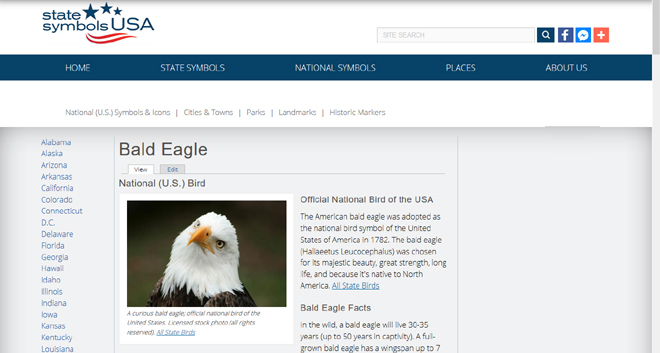 Example: "Edit Bald Eagle Page;"
3. CREDIT LINE. If you want credit for your submission, type your information at the end of the article ("Contribution by ..."). A link to your website in the credit is usually approved (example). Enter the Name of the source page in the "Title" box, and paste the web page address in the "URL" box. We generally do not approve "dot com" links, but there are exceptions (.com is short for "commercial"). If you need to enter additional links, use the "Add Another Item" button ( ). Please provide Source links if you add text content to an article. If your information source is not a website, type a description of your source(s) at the bottom of the article in the "Main Description" box. Your submission will be reviewed by a member of our staff before publication to the live website. If there's already a page on your topic, please edit the existing page. Type the Name of a place (town or city, landmark, park, or historic marker), a state symbol, or a historic person's name. 5. SUBTITLE. Optional. Our staff usually completes this field. 8. ITEM TYPE. Click drop-down arrow and select an "Item Type" for your page; a "Place," a "Symbol | Official Item," or a "Historic| Iconic American. 9. CATEGORY. If the Item Type is "Place" or "Symbol," you must select at least one category on the list that appears. 10. ADDRESS. Optional. If "Place" is the Item Type, an "Address" section appears; enter an address if you want a Google map to appear on the page. 11. SHORT DESCRIPTION. Optional. "Short Description" is a summary of the article's content for search engines that does not appear on the published page. Our staff normally completes this field. 12. MAIN DESCRIPTION. Click inside the "Main Description" box to position your cursor. Type or paste in your article text. Phrase facts in your own words! If you quote a source in your article, put quotation marks around the quote and identify the source in the article. 13. CREDIT. If you want credit for your submission, type your information at the end of the article ("Contribution by ..."). A link to your website in the credit is usually approved (example). We generally do not approve "dot com" links, but there are exceptions (.com is short for "commercial"). Click the "Add another item" button if you have more than two sources: . If your information source is not a website, type a description of your source(s) at the bottom of the article (in the "Main Description" box). 15. REFERENCES. Adding Reference links is optional. Enter the name(s) and URLs of other reputable web pages on this topic if you feel our readers will benefit. Click "Add another item" if you have more than two: . 16. SAVE YOUR WORK! Click the "Save Item" button at bottom of the page to save your changes: . You'll see a "Submission Received" confirmation message. The new page will be reviewed by a member of our staff before publication to the live website. Not good with a camera? Many photos are available with a public domain or creative commons license to illustrate your page. Find a photo on the web. 2. CREATE NEW FILE. 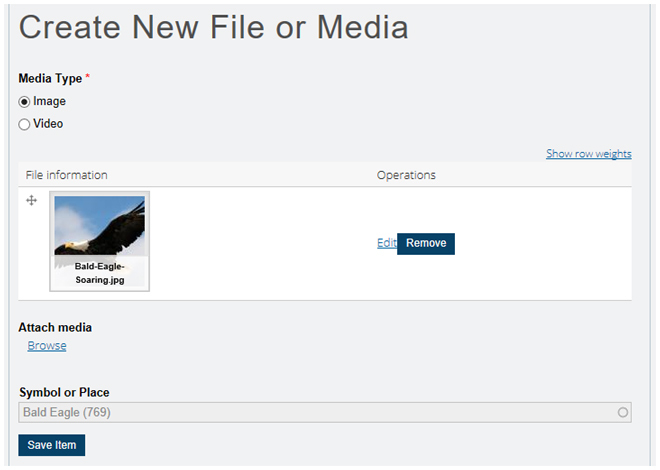 The "Create New File or Media" page opens. 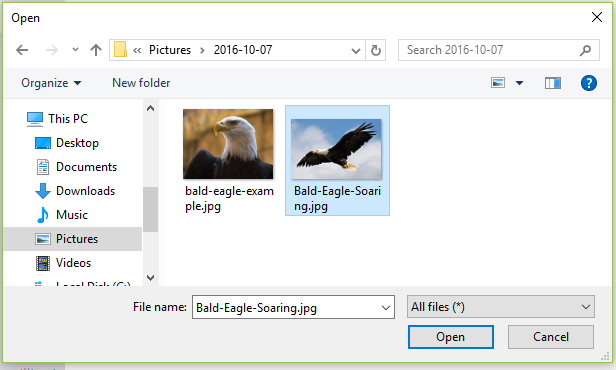 "Image" is the default selection under "Media Type," so just click the "Browse" link under "Attach media;"
7.1 Name of Photo. Type the topic of your photo. 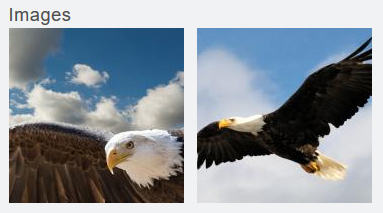 For our example, I would type "Bald eagle soaring" (no period). 7.2 Main Description. Optional - add details about the photo here (where the shot was taken or other description). 7.3 Photographer. Type the name of the photographer. 7.5 URL. Paste the web address (URL) of the original image if it was copied from the web. 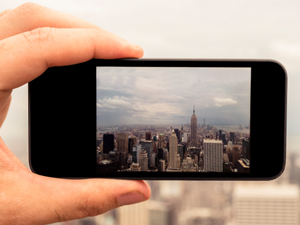 See How to Find a Photo on the Web for details on the different copyright licenses. 7.6 Alt Text. Optional. "Alternative Text" is used by screen readers, search engines, and when the image cannot be loaded. By adding "Alt Text" you improve accessibility and search engine optimization. 7.7 Title Text. Optional. "Title Text" is used in the tool tip when a mouse hovers over the image. Adding "Title Text" makes it easier to understand the context of an image and improves usability. To upload a second photo to this page, click the Browse link again (under "Attach media"). 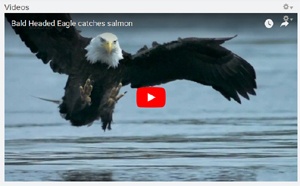 Click the Browse link under "Video" to open the Media browser. 3.4 CLICK NEXT. 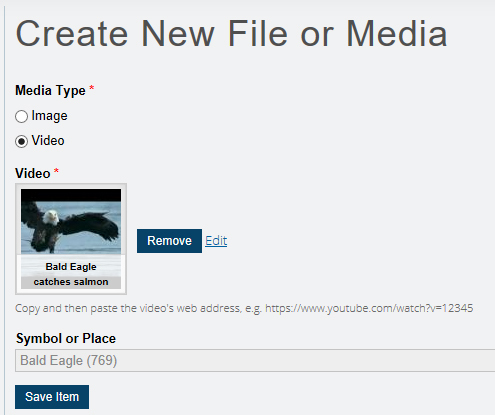 Click the "Next" button in Media browser : to open the video description section. Leave the "Attribution" box blank and click the "Save" button: to save the file description.